Member of Parliament for Odododiodio Constituency, Nii Lante Vanderpuye, refused to retract and apologize for saying that the opposition National Democratic Congress, NDC, will free incarcerated former GYEEDA Coordinator Abuga Pele, should the party return to power after election 2020. The General Secretary of the NDC, Johnson Asiedu Nketia, revealed this on Accra-based Radio Gold. The NDC MP, told Citi News on the sidelines of the party's Unity Walk at Somanya in the Eastern Region, that they were working hard to win power in the 2020 elections, after which they will free Abuga Pele, who was jailed alongside businessman, Philip Assibit for causing financial loss to the state. “It is unfortunate but I can only say that this will not dampen the spirit of the NDC. Between 2001 and 2004, they sentenced Tsatsu Tsikata, Dan Abodakpi, Ibrahim Adam and Kwame Peprah. It did not stop us from winning elections in 2008. We are going to win the elections and bring Abuga Pele out,” Nii Lante had stated. Hours after the comment widely publicized by Citi News, the party's founder, Jerry John Rawlings condemned Nii Lante’s comments. The NDC then issued a statement, and distanced itself from the comment. It also stated categorically that it had no plans to free Abuga Pele as suggested by the MP. Defending the party's position, Mr. Nketia explained that the party issued the rebuttal because the MP failed to retract and apologize for the comment when he personally contacted him. “He made claims about the party that are not correct so we came to set the records straight. He has the right to state his position but if a comment is made to implicate the party the gatekeepers will have to set the records straight. I did contact him (Nii Lantey Vanderpuye). 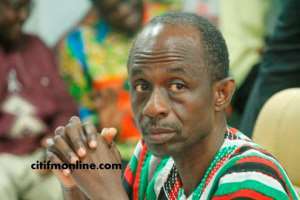 He was the first person I spoke to but he insisted that he stands by that statement,” Mr. Asiedu Nketia said. Abuga Pele, a former NDC MP for Chiana Paga, was sentenced alongside the Chief Executive Officer of Goodwill International Group, Philip Assibit, to a combined jail-term of 18 years on various counts, including willfully causing financial loss to the state. Pele was handed a four and six-year sentence which will run concurrently whilst Assibit got concurrent sentences of 12 and four years on different counts. Philip Assibit has since served notice will be appealing his 16-year jail term alongside an application for bail. The case, which had been running for four years, was started by the NDC administration under John Mahama.